Water is clear. The sky is blue. So why are clouds white? And if regular clouds are white, why are rain clouds gray? On sunny days, at picnics, we relax on the sweet-smelling grass, look up at the clouds and idly wonder if they all look like skeletal hands reaching down to pluck us from the earth (or if that's just us). A better question to ponder would be why we can see them at all. Water droplets are clear – although en masse they do have a bluish tinge, and the sky above is blue. Blue against blue doesn't suddenly turn white, and neither does clear against blue. Whether or not there are clouds in the sky should be a mystery. They should be invisible, instead of an amorphous white mass that always seems to resemble the last person to turn us down for a date. Twice. Visible light comes at us in many different wavelengths, each corresponding to a slightly different color. When all the wavelengths combine, they show up as white light. White light may be a combination of wavelengths, but it's not a permanent combination of them. Under certain circumstances, wavelengths can be separated out. For example, earth's atmosphere tends to scatter blue light, while letting the other wavelengths of light pass through in a straight line. Because of this, the sky is blue – made up of diffuse, scattered light – while the sunlight that falls around us tends to be more golden, because the blue wavelengths of light have been filtered out. That's called Rayleigh scattering. Clouds also scatter light. Unlike oxygen and nitrogen molecules, which are picky about which kind of light they scatter, larger water droplets scatter all kinds of light in all directions. This is called Mie Scattering. When we look up at clouds, we see red light, blue light, yellow and orange and green light, all coming at us. We can't see the individual colors, though, because since they're all coming at our eye from the same place. Together, they all combine - Power Ranger style - to make white light. 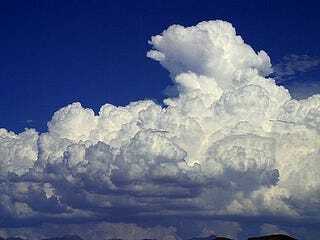 That's what hits our eyes, and makes us perceive clouds as white. Or that's what doesn't hit our eyes, in the case of rainclouds. While harmless, decorative clouds are glowing white, clouds that mean business slide down into the gray scale and even develop black streaks. This can be confusing. No matter how much white light is scattered, it's still white light. There's one way to turn white, or any color, into black: turn off the lights. Mie Scattering scatters light in all directions. Rainclouds tend to be both wider and taller than regular clouds. The more layers of water droplets that light has to pass through, the more likely the droplets are to send that light flying right back where it came from while shouting, ‘Shove that up your space hole!' Instead of filtering out blue light, high, dense clouds filter out all light. That makes them darker and darker when they're seen from the ground.